MDU has released physical counselling date on vacant seats on official website for admission to MCA three years, MCA lateral entry, MCA computer science M Tech computer science on official website. The online application form will be available for interested candidates up to 29th August 2018. The physical counselling will be held on 13th August 2018 at 10 a.m in the morning. MDU B.Ed hearing of umc for session June-2018 exam will be conducted on 20th August at 1 p.m. in the university premises. 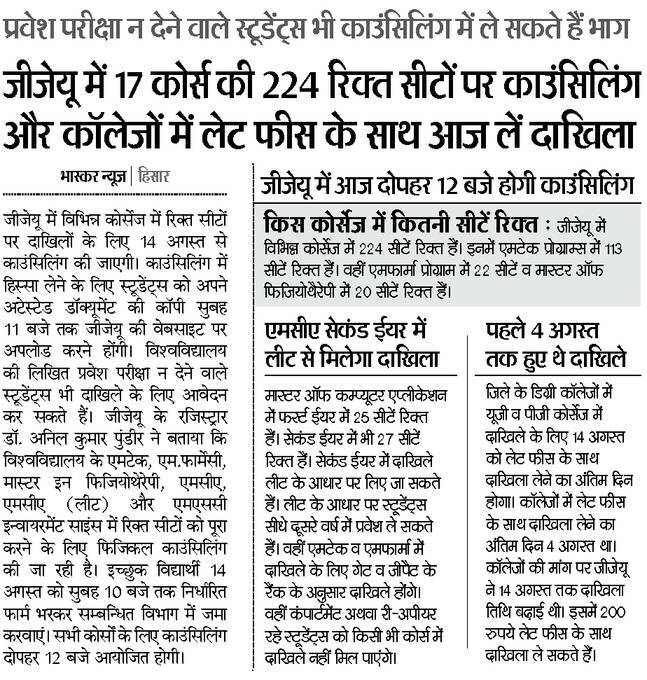 The candidates who have not given exam for admission can also attend the counselling open for 224 weekend seats on 17 courses. The counselling for admission on all vacant seats of various courses will be organised at 12 noon. 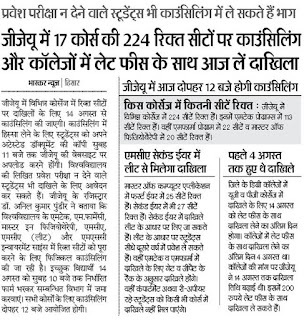 The candidate can get admission in second year directly to MCA through LEET program. Earlier guru Jambheshwar University had invited online application for admission to undergraduate and postgraduate program. Now, the last date to take admission with late fees is 14th August 2018. The late fees for exam is 200 rupees. Earlier it was 14th August 2018. Extension of date of fresh admission as well as promotion for UG/PG courses for the session 2018-19 with late fee Rs. 1000. On 21.07.2018 - MDU UG PG Centralized Admission 2018-19 Physical Counseling will be held on 27.07.2018. On 18.07.2018 - MDU Non-Centralized Admission Result/ Merit List has been declared for various courses on official website. The good news is that MDU has uploaded online admit card for entrance exam to be held for centralized admission under the university. Those candidates who have applied online form; they can download their MDUCEE Admit Card from the link given here. GPAT score (All India Rank) will be provided for admission of the candidates. All original certificates will be verified and a set of self-attested documents will be submitted at the time of counseling/ document verification in the university. 7. Income certificate, if required.